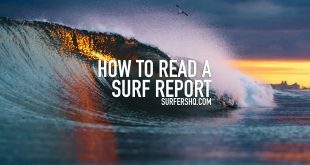 I think I’ve come to this realization that when you surf, when you are truly immersed into the world of surfing and pick up the surf jargon, then it is almost like talking in a completely different language, so you need a separate surfing dictionary. 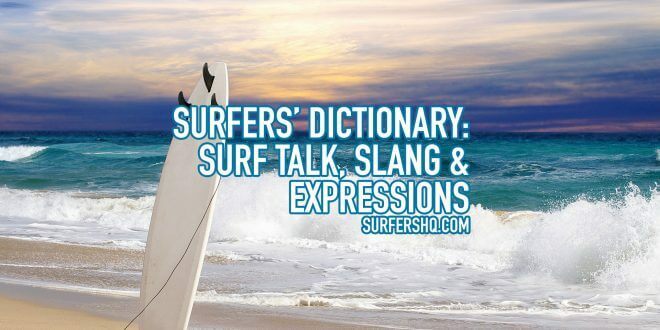 So we’ve put together this extremely handy guide of surfer slang, surf expressions and surf jargon for your friends and family to have some kind of clue what you’re talking about! Part of a manoeuvre where the surfer and board leave the water and are airborne. This is where the surfer takes off on a wave on the edge of a peak and then surfs through the hollow part. Surfing in a direction that means your back is towards the wave. A bit more tricky to master than forehand. When good surfable waves go flat and lack power. When you get off your board in order to avoid being knocked over, usually in rough conditions. The undersea sand deposits which play an important role in determining the size and shape of the waves. As a noun it can refer to the hollow part of the wave and as a verb it can refer to surfing in that hollow part. Should be pretty obvious – beach break means waves that are good enough to break at the beach. Not all of them get that far. Like a blank canvas, the block from which a surfboard is crafted. Knee-length, lightweight quick drying shorts popular with surfers. A mainly Australian term – it refers to a large set of waves that break a little way out from shore. A surfboard with at least 5 fins. When you’re stuck shore-side and can’t get out far enough to catch a wave. A deep spot where waves won’t normally break. Choppy waves means that there is a strong cross wind, giving the waves a rough surface and stopping them from breaking cleanly. When a wave doesn’t break cleanly and smoothly but clamps down on a surfer riding it – like a clam snapping shut. The kind of waves you really want. The waves are smooth, rideable and breaking cleanly with the right amount of offshore wind. A wave that break early, ahead of the line up. Close-out is when a wave breaks evenly all the way across the bay or channel at the same time, making it unridable as you can’t get out far enough to actually surf it. A 180° turn, which basically changes the direction you’re surfing in to head back towards where the power is in the wave. A dent, depression or scratch in a surfboard, usually caused by accidental damage. The initial downward slide, which gets you into the wave. Not to be confused with ‘drop in’ below. Being a d!ck and jumping in on a wave someone else is already riding. Riding your board with one knee down. Pushing your board underwater when faced with an oncoming wave to avoid riding it. When a wave breaks in big sections, making it difficult to surf. Falling off your board. Same as wipe out. A board designed for surfing very big waves. Basically the front of the wave – the bit which starts to curve over. Turning sharply and surfing in the direction the wave is breaking in. Fin control system. Having removable fins on your board so that if one breaks it is easily replaceable. The distance the wind blows over water. The fin goes on the underside of the board to help you steer it. A sharp turn where the surfboard fins are out of the water. Like the name says – no waves. Riding your board along the top of a breaking wave or foam. 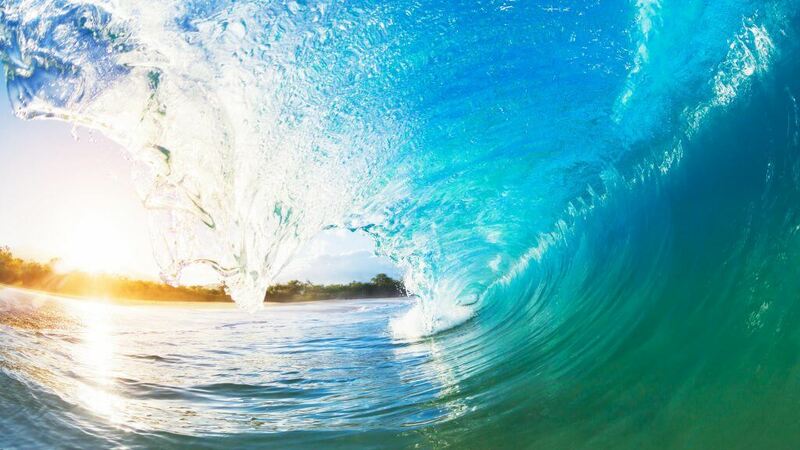 Surfing a wave so that you are facing it. When you have a big wave that rolls over, but leaves a “tunnel” of air with the surfer inside. Kind of like the name – when the waves are clean and smooth. When waves are dangerous or a bit intimidating to ride. Riding with your right foot forward and left foot back. A board designed for big waves. Usually long and narrow. Facing backwards and putting your heels over the edge of your board. Putting your toes from one foot (hang five) or from both feet (hang ten) over the nose of your board. A term to describe powerful waves. The spot where waves are breaking. The white foam after waves have broken – like whitewater. Unsurprisingly, same thing as barrel. When a surfer decides to kneel on the surfboard to ride waves. A surfer of limited skill, usually they think they’re much better at surfing than they actually are. The cord attached to the end of a surfboard, from which the other end usually goes around the surfer’s ankle. Also known as leg rope. A bit like if you’re in a race, the line-up is basically like the start line where most surfers wait to catch a wave. Also known as the crest of a wave. The bit that surges forward when the wave breaks and gives rise to foam/whitewater. A fairly long, medium width board designed for surfing medium to small waves. A more dynamic surfboard that turns easily. Great for smaller waves. A wave big enough that it would cover a whole American-style Mac truck. A manoeuvre where the surfer turns his or her board to the top of the wave and pivots on the lip. The wind direction you really want. The wind blows into the face of the wave, so it slows down and breaks with more power. The wind direction blowing towards shore, and can create choppy and messy waves. Like the back of the wave, the section that breaks further out to sea. When a surfer falls off their board and gets carried along the lip of the wave. Also referred to as ‘wash cycle’. When the nose of your board dips underwater – usually manages to end your ride. A fine, narrow tail of surfboard. Some will be rounded, some will be slightly pointed. Usually found on longboard. The bit right in front of the crest. If you wipe out, you will usually end up going here first. 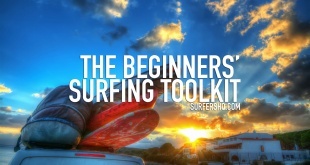 A board made from plastic and injected with foam – ideal surfboard for beginners. An up-down manoeuvre used to generate speed and power on a wave. A board with 4 fins, set in two lots of two, one set just behind the other. A surfer’s collection of boards, usually for different types of waves. The side edges of a surfboard. When a surfer hits the lip of the wave and then enters it in quick succession. A surfboard designed for huge waves, like a gun or elephant gun. A strong current as water flows back out to sea. Try to avoid getting caught in one! The curve of a board from nose to tail. Similar to a duck dive, this involves flipping your board upside down to get past a breaking wave to get to the line-up. 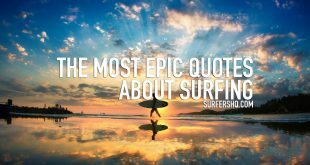 Someone that regular buys surfing gear, and maybe has an interest in surfing but has never surfed before. A drastic turn off the top of a wave. Like sloppy, meaning a low quality surf. Don’t do it! Basically stealing someone else’s wave. The extra water thrown up by a surfer’s board when he makes a powerful turn. Always a delight to see. A board with a straighter tail, ideal for surfing small or medium waves and is the most common shape around. The line (usually made of wood) that runs down the middle of a board to give it strength and sturdiness. Another type of surfboard tail, to go along with square tail and pin tail, it has more of a V or W shape. The back end of the board. A move where the surfer allows the tail of the board to slide across the lip of the wave. Two people surfing together on one board. Can’t say I’d recommend it, but it’s been done plenty. A board with 3 fins. A surfboard that isn’t very easy to turn. In stronger or faster waves, this can be useful as it will be more stable. Not quite as grim as it sounds, but basically when a surfer gets knocked underwater and tried to climb up the leash of their board, the board sits upright in the water. Using a jet ski to get towed to the line up because the waves are too fast or powerful to paddle to. Like you imagine, the hollow part of the wave when the crest falls over creating a hollow tube. Surfers paradise. A board with 2 fins. A wave animation chart, it shows the size of a swell for the coming few days. It’s great for surf forecasting. A special kind of wax which surfers apply to board to give them more traction and grip and so that their feet don’t slip off. Basically what it says in the name. When a wave breaks, the white foamy bit. You should avoid this one. When you get wiped out and the force of the waves hold you underwater. You don’t really want this to happen to you – it carries a high risk of death! 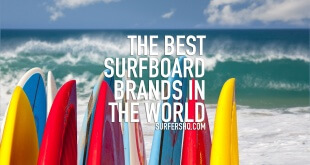 Next What Are The Best Surfboards For Beginners?